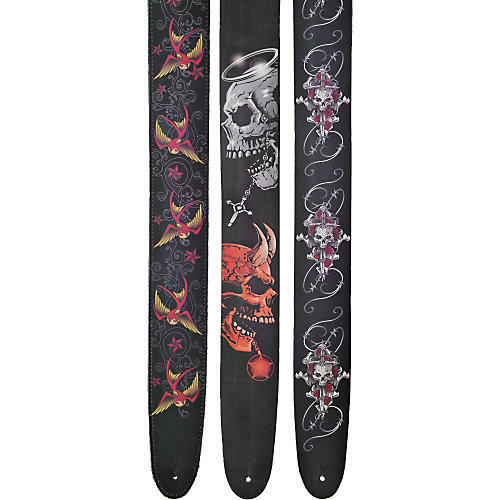 The officially licensed D'Addario Lethal Threat Guitar Strap collection includes some of Lethal Threat's signature artwork on 2.5" leather straps. This series includes symbols like the classic tattoo rockingbird (similar to classic sparrow tattoos) and some killer skull designs to enhance the look of your already-lethal guitar. Lethal Threat Designs is a full-service art and design-licensing agency with cutting-edge artwork based on its line of highly successful automotive and motorcycle decals. If you're lucky enough to own a motorcycle or hot-rod, you may already recognize some of these Lethal Threat patterns and match your guitar with your hog or rod for the ultimate threatening style.